Opening lines: When will I get There? How will I know? Will there be a sign that says, “Here is There”? Synopsis: Will it Take long to get There? Will it be tomorrow? How will I know? Will I be as tall as a house? So many questions, this story is told exclusively in questions that capture the uncertainty and persistence of children, about growing up. Seen through the eyes of a young girl who ponders what might or might not lie in store for her. Why I like it: I wasn’t sure when I first picked it up what really attracted me to it. The amazing sparse text that didn’t at first seem to tell a story; at least not until you read it again… Then there are the illustrations. A ruffled-haired little girl standing alone, pondering what awaits for her over those fluffy cotton ball pathways and pages of sweeping scenery we travel within her imagination. The book is both precious, thoughtful, wistful yet deep. It inspires all ages to think and ask the question. I was interested to learn through reviews that the book is both educational, used in the classroom to inspire children to think and use their imagination. It can be used both in the class and at home for those meaningful discussions. Also that people bought this as a graduation gift, for the student that is now stepping out into the big wide world, inspiring them to think of their future, what is out there? What will they do? And how will they know? 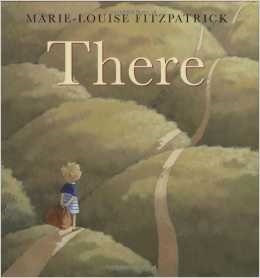 Marie-Louise Fitzpatrick, living in Ireland has written and illustrated a number of award-winning children’s books and her new blog , shared with her husband http://thebelugasarewatching.com/ I found very interesting. I also was very interested in reading this…. http://www.marielouisefitzpatrick.com/2013/10/28/giant-press-pass/ article on her old blog. What I liked most, the little girl decides on her own to live in the moment. Here the book has been used this way… http://mrspal.org/category/thoughts-to-ponder/ an educational blog. Pop over and visit the lovely author, Susanna Leonard Hill’s blog and find the tab for Perfect Picture Books. Her blog is full of resources links and activities associated with books reviewed by many authors. This entry was posted in Children's literature, Picture Book Review and tagged Children's Picture book, childrens literature, Marie Louise Fitzpatrick, Susanna Leonard Hill. Bookmark the permalink. Intriguing book. I really enjoyed your review. And, I especially like how it ends with the girl living here life in the moment — a very important way for all of us. Will have to check this out. Glad you liked this, Pat. I didn’t realise there was no PPBF this week, so will hopefully keep it till next week. It’s a very special book that should go on Susanna’s list. Contemplating life, Where is there? Will there be a rainbow? Can I take teddy? So cute and yet so meaningful. One never knows what is in front of us, or just around the corner. True we should live life in the moment. Hoping you are having a great weekend. I agree. Just add it to her list May 9 — no PPFB next week either. I just listed my book as a Children’s Book Review when she isn’t posting PPFB. You almost always get me hooked with a great cover!!! I know, isn’t it adorable. Often a little, says a lot! Happy weekend, Julie! I’m in love with this one already! Just from the picture and your review! Thanks! Thank you so glad you love it, Rhythm. I love this approach to a mature topic for kids. The cover is fabulous. Thanks, Joanna. I was surprised to learn such a wide range of ages are drawn to it.